Pioneers in the industry, we offer overhead traveling crane, electric overhead traveling crane, traveling cranes and traveling crane mount overhead crane from India. 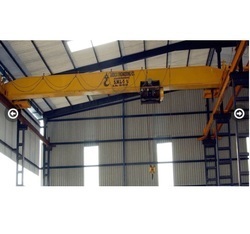 We are engaged in manufacturing and wholesaling Overhead Traveling Crane in various specifications. These are excellent electrically operated machines which are used for lifting, lowering and transporting loads. 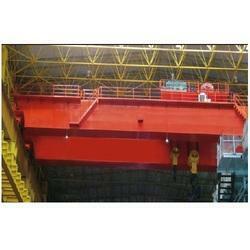 These are equipped with a movable bridge for carrying fixed or movable hoisting mechanism. These crane are also provided with fail safe instant brakes for having a smooth and trouble free operation. Our crane are offered at reasonable prices. 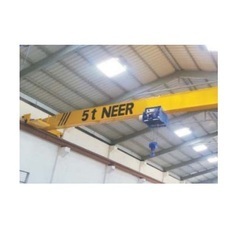 We manufacturer and supplier of Electric Overhead Traveling Crane which are known as Overhead Crane, We offer these Material Handling Heavy Equipment in various technical specifications to cater to the requirements of the customers. Being compact in size these products requires minimum area to install and is flawless in performance. With the assistance of skilled and dedicated professionals, we are able to cater diverse requirements of the clients efficiently. We are the leading manufacturer, trader and wholsaler of Traveling Cranes. Fabricated using cutting edge technology, these material handling cranes are used for operation on a lower level beneath a large traveling crane system. Our all products are designed by technical, trained professionals using supreme quality raw material, which insures its high efficiency, excellent quality and longer working life. These have excellent structure and are offered at reasonable price. We manufacturer and supplier of Traveling Crane Mount which are known as Overhead Crane, We offer these Material Handling Heavy Equipment in various technical specifications to cater to the requirements of the customers. Being compact in size these products requires minimum area to install and is flawless in performance. With the assistance of skilled and dedicated professionals, we are able to cater diverse requirements of the clients efficiently.